Graeme grew up in Clydebank, close to Glasgow. The shipbuilding skyline to the south and Kilpatrick Hills to the north provided the boundaries for an industrial town, famed for its sewing machine and ship building history. By the time Graeme reached his teenage years, Thatcher’s Britain was in full flight. For Clydebank it saw a steep decline of the industries but for GC, Clydebank provided a determination to find a way out, as unemployment rose above the horizon for the local school leavers who chose to stick around. He wasn’t alone in the need to move on. A chance encounter on the school bus in 1978 saw Graeme and Tommy Cunningham hit it off and the Wet Wet Wet storybook had its opening chapter. Over the next five years Neil Mitchell, Marti Pellow and Graeme Duffin joined the Wet Wet Wet fold. Their common love of soul music and the rich Scottish heritage of performing live ignited a spark that was quickly setting the charts on fire. 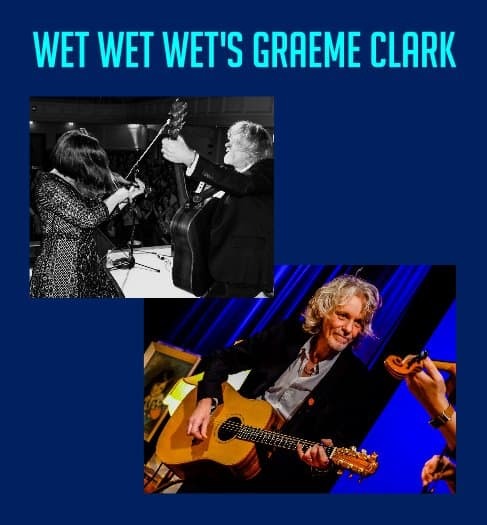 3 number one hits, countless hit singles and albums saw the band and Graeme recognised as one of the most talented song writers of the time with Graeme presented with a life time achievement award in 2018. Graeme will be joined by renowned violinist Fiona Cuthill, his accompanying fiddle player. Fiona has been present on stage with him for a number of years, augmenting his solo acoustic with a beautiful and almost lyrical tone. “Don’t be deceived by, or take light of this piece of musicianship, simply defined as a fiddle” he muses. This will be a fantastic opportunity to catch a very special performance on the acoustic stage from a legendary name.